What is just one penny? Most of us don't think it is all that much. We may even groan a little when we get pennies in our change. However, small change can create a big difference in the life of a shelter rabbit. Bunspace is a community for rabbit lovers, built by rabbit lovers. Create a webpage for your furry kids, make new friends, share your bunny photos, tell your stories, and much more... Join now! 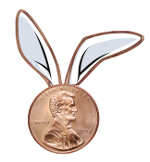 © Copyright 2011 Pennies for Bunnies. All Rights Reserved.